Play-Asia Selling Game Boy Printers Again, For Some Reason | OhGizmo! By Andrew Liszewski on 03/03/08 • Leave a comment! Even though the Game Boy camera could only take 128×112 pixel grayscale photos, it still managed to build up a bit of a following, even with serious photographers. In fact the cover of Neil Young’s Silver & Gold album actually featured a shot taken by the camera. 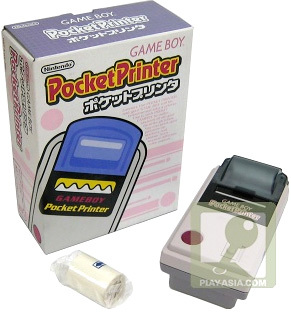 However the Game Boy Printer accessory never really gained as much popularity. While it was the easiest way to get your photos off the Game Boy Camera, it required its own special thermal paper and a small army of C batteries to keep it powered. But if you’ve been kicking yourself over the past 10 years for not picking one up way back in 1998, now’s your chance. Play-Asia has managed to find a limited stock of the printers which they’re now selling for just $9.90 each. The printer is obviously the Japanese version, but since there’s no region protection you should have no trouble using it with a North American Game Boy.